The Japanese experimental free jazz scene has really evolved over the last decade with artists such as Otomo Yoshihide and Yasuhiro Yoshigaki leading the way in their various groups and collaborations. One of the best groups both perform in is the quartet Emergency!. I'm assuming an homage to the legendary Tony Williams, Emergency! combines elements of the aforementioned drumming legend (thanks to the groups founder Yoshigaki), King Crimson and Last Exit. 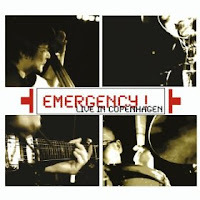 But unlike Fripp and Laswell's tour de force, Emergency! takes very specific moments to spin the guitar wall of sound into layered ambient soundscapes. Live In Copenhagen documents the group's first exploration outside of its native country and takes their free form vehicle to the fertile grounds of one of Europe's more experimental countries, Denmark. And Emergency! really do impress. The Yoshigaki penned "Re-Baptizum", opens the evening with a bold exchange between Yoshihide and Saito that shift between gentle and storm-threatening. This all with some superb playing by the founder, Yoshigaki. Things get really intriguing after Yoshigaki's original as the group move through three covers to finish out this live concert. A bizarre choice--"Sing, Sing, Sing" is fascinating, fun and soaring. Lots of action going on in this one. It's worth continued listens and probably worth the price of the CD altogether. Two beautiful and complicated compositions from two legends that seem completely appropriate in the hands of this quartet close out the evening. First, the Charles Mingus protest piece, "Fables Of Faubus". Yoshigaki's playing throughout this live recording moves from rippling to atmospheric with ease. The quartet tackles Rahsaan Roland Kirk's classic, "The Inflated Tear" as the final number and it is as intense, deep and touching as its original. At this point in 2006 when this was recorded, Emergency! had only recorded two albums, but those albums are phenomenal and worth seeking out. While Emergency! are categorized as an experimental outfit, Live In Copenhagen demonstrates that this quartet has vision and structure that goes far beyond experimental. Highly Recommended.